Balance: a state of equilibrium or equipoise; equal distribution of weight, amount, etc. When people discuss work-life balance, I always envision a two-sided scale with the time and effort devoted to “work” on one side and “life” (everything else) on the other. Each item is discrete (it has a beginning and an end, a value, a priority, and a definitive label). Something can’t be both “work” and “life” at the same time. One side’s gain is always the other side’s loss. Personally, balance doesn’t work for me. It’s too confining. Blending: to mix smoothly and inseparably together. Where balance is discrete, blending is continuous. 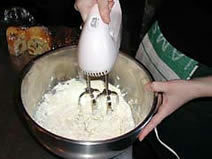 The process is continuous and the ingredients become continuous once added to the mix. Why can’t we approach the allocation of our time and energy, as we would a recipe we’ve tried that has never been recorded anywhere? We have a general idea of how it should taste, but we vary ingredients to find the right mix. As our tastes change over time, ingredients may be added, removed, or used in a different amount. Blending requires us to be open-minded and willing to experiment, reflect, and adjust. It also requires us to listen. If the blend isn’t working for us, or the “critical” people around us, then we vary the recipe until the right blend is achieved. Relationships are the first place I noticed blending. When I look at the people with whom I spend time I find it difficult to label my relationships with most of them. Are they my friends, family, associates, co-workers, mentors, or protégés? One person may be all of those things – even at the same time. Blogging is another place I’ve felt “blended”. Am I blogging for business, as a hobby, for fun, to meet people, or for professional development? Yes. The same effort produces different outcomes that balance would require us to place in separate buckets. For me, imagining that all of the aspects of my life mix together to form different results at different times is comforting. Which do you prefer – balance or blending? There isn’t really a right or wrong answer. What works for you? Thanks, Tim! I must admit I'm completely unbalanced! (ask anyone that knows me). Thanks for stopping by. Great post, Ann. As somebody who constantly "strives for balance" I especially appreciated the paradigm shift... perhaps blending IS what I've been pursuing all these years. Heather - nice to see you! Balance makes me a lot more stressed too - it's like I'm never doing anything well enough. John - I read the article (neat) and took the test. The funny part about that work-life balance test is that it was hard to answer the questions for me. It asked about discrete time spent on discrete activities (how many hours on work, other, commute, etc.). When things overlap it's hard to say. The article was a riot though! Thanks! Balancing makes me feel like I have to neglect one thing to make the other successful. And feel guilty about it. Who wants to eat the same thing all the time? When cooking, figuring out how to mix up the recipe, is as fun as eating it. Blending gives me the options and freedom to take risks. Failures come out the other side as successes.